There’s a reason Sachia Tinsley has been keeping (relatively) quiet about Peyrassol Cafe at Southport, open since October 1. “It’s kind of precious right now,” she explained by phone last week, speaking of time she and her husband, Scott Cory, spent building-out the kitchen and building-up a clientele at the lakefront cafe near Renton’s Coulon Park. Sachia is no stranger to restaurant openings. 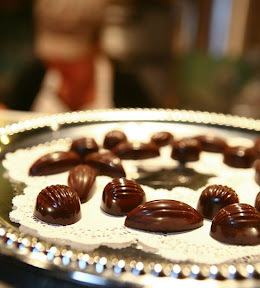 Along with her sister Sabrina Tinsley and brother-in-law Pietro Borghesi, she introduced Seattle to the simple fare of Emilia-Romagna in 1998, when the trio opened the original La Spiga on Capitol Hill. When the restaurant relocated to grand new quarters nearly a decade later, Sachia opted out, and before opening Peyrassol spent three-plus years as executive pastry-chef at Wild Ginger. 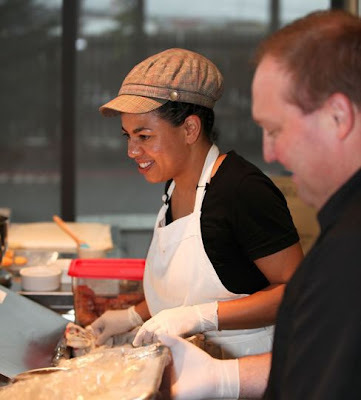 Sachia Tinsley in the kitchen at Peyrassol with her husband, Scott Cory. Their cafe, open Mondays through Saturdays, is located at 1083 Lake Washington Boulevard North. Pasta-making was her thing at La Spiga. Heading the pastry-team at Wild Ginger came next. 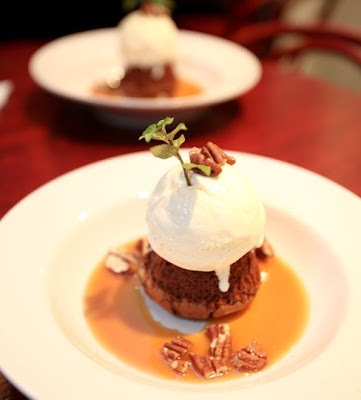 Now Sachia’s working for herself in Renton, making sweets like this warm brownie with caramel sauce, housemade chocolate-chip gelato and spiced pecans. “I wanted a little place again,” she told me, reminiscing about the opening of the original La Spiga, and the rustic, handcrafted bar, counter, chairs, tiles and other furnishings specially designed and imported from Cesena, Italy (some of which are still on display at the recently relocated Tidbit Bistro). Cut to this summer, when Sachia and Scott found a coffee-and-panini shop in the Bristol apartment complex, signed the lease on a space already outfitted with tables, chairs, refrigeration and an espresso machine, and got to work making it their own. Here, you might stop in for espresso drinks, pastries and light breakfasts in the morning; soup, salads, sandwiches and housemade pastas at lunch; and heartier Euro-styled fare at dinner. But there’s another more practical reason Sachia and Scott waited till December to celebrate their grand opening. “I’m overwhelmed!” admits Sachia, who’s been busy “cooking, baking, braising duck legs, making pasta” at the 40-seat cafe better described, she says, as a coffeehouse, kitchen and bar. 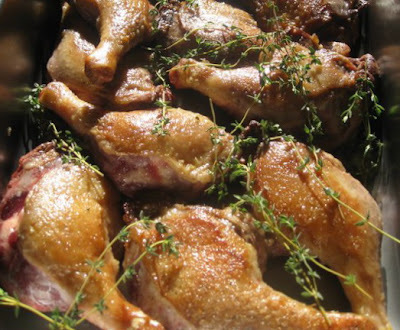 Thyme for dinner: wine-braised moulard duck legs. I’ll bet they’d taste pretty good with a nice bottle of Commanderie de Peyrassol. 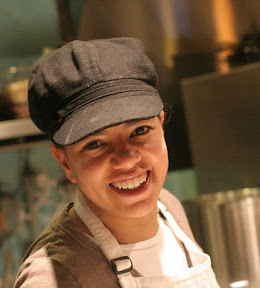 Sachia’s still looking for “the perfect person” to join her in the kitchen. Meanwhile, she’s had plenty of help from her husband, who by day is the head wine-buyer at University Village QFC and by night plays host and sommelier at Peyrassol (named for one of their favorite French wines). You’ll find him here mixing cocktails, schmoozing with customers and — in his spare time — lending a hand in the kitchen. Yesterday the couple celebrated with friends and patrons, sipping Champagne and hosting an open house where folks were encouraged to do some holiday shopping, purchasing wine (sold in a retail nook), local artwork or some of Sachia’s handmade chocolates.